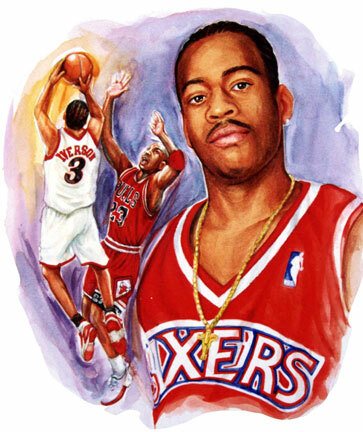 Basketball greats has been a favorite for the artist to capture on canvas. Especially when he's had the pleasure of meeting and discussing his work with each player. Some of these pieces were personally autographed by the athlete and arist and used for raising funds for selected charities. 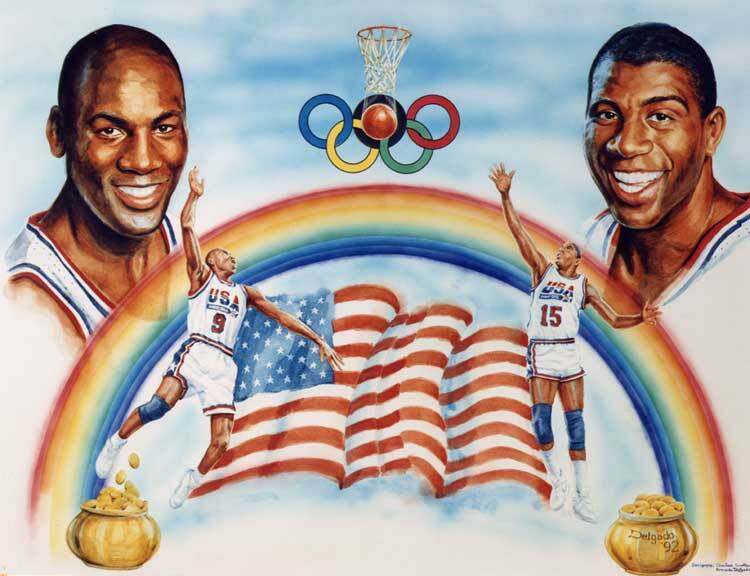 Delgado was commissioned to created this work as a tribute to the two members of first U.S. Olympic "dream" team. They are of course Hall of famers, Magic Johnson and Michael Jordan, legends of the hardwood. This piece symbolizes the pot of Olympic gold that they achieved by winning the medal at Barcelona in 1992. 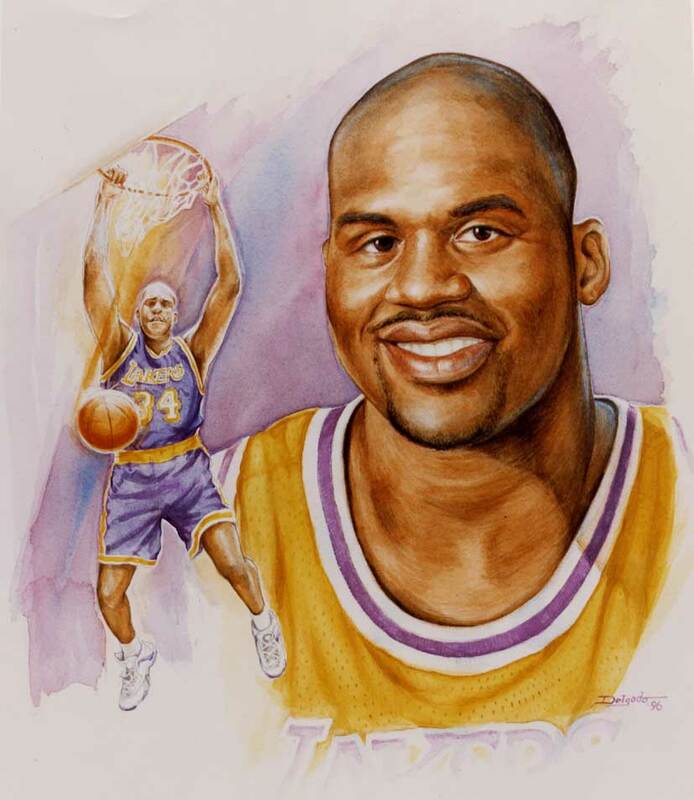 This pieces was the first rendition ever as Shaquille O'Neal as a Los Angeles Laker after he left the Magic. 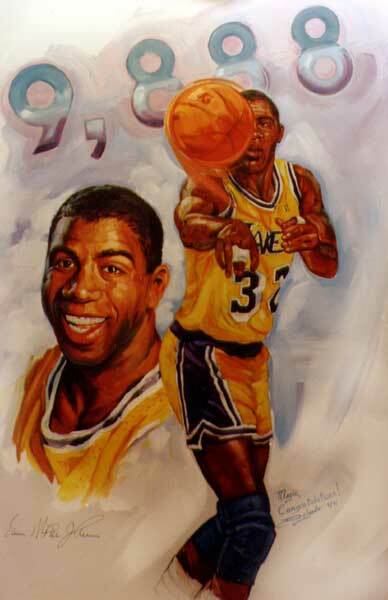 This work was created for the MDA, Magic Johnson Celebrity Charity Event were Magic honored Shaquille. This original was used for the cover of the invitations and programs. Later that evening the original was auctioned off live on stage with the proceeds going to the charity. Perhaps on of NBA's most promising young stars and future Hall of Famer Alan Iversion brings to the table a dynamic and explosive style to the game of basketball. This is an original commission piece and is now property of the Iversion's estate. 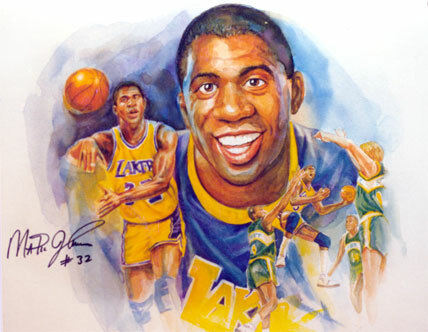 Both commissioned paintings shown here represents the great Los Angeles Laker, Magic Johnson. For 5 straight years the artist work directly with the Hall of Famer in creating original works for his MDA Super Star MDA Charity held yearly at Beverly Hills. The work on the left is a commissioned piece that was presented to him as a gift for breaking the total record of 9887 assists. This original is now displayed at his estate.